Autumn leaves sit atop a rock along the Sand River in Lake Superior Provincial Park in Ontario, Canada, barely escaping the flow of the water. Colorful Autumn leaves will eventually get washed downstream by the flow of the waterfall along the Sand River in Lake Superior Provincial Park in Ontario, but for now, escaping this has been easy. Once the water becomes more powerful, the leaves will have little chance of escaping and will then flow with water until becoming trapped between the rocks. Fall leaves beside a waterfall along the Sand River, Pinguisibi Trail, Lake Superior, Lake Superior Provincial Park, Great Lakes, Ontario, Canada. 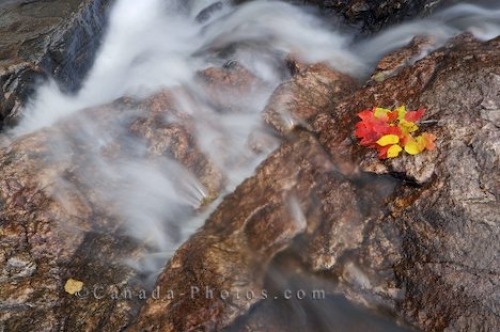 Picture of Autumn colored leaves escaping the flow of the Sand River in Lake Superior Provincial Park in Ontario.